By all rights—or at least government regulations--Chinese New Year holiday should be over. This year, it began officially on January 27th and is supposed to end on February 2nd. Like many things here in China, central regulations mean little to local residents. Beijing’s schedule isn’t theirs. Some people are already back to work, while a good many others are still somewhere else, making some cities quiet and some towns overflowing with folks. Many citizens, especially the affluent and urban classes (often mistakenly categorized as “middle class”), left early and plan on returning late. Some took holidays here or abroad before the actual Chinese New Year date of January 28th when they rendezvoused with family in their ancestral hometown, or (increasingly) elsewhere in China and are continuing their time away from work even now. Why that’s happening isn’t entirely clear but there are some possible explanations. When China was made up primarily of large state-owned companies and conglomerates, rules and traditions were better enforced where holidays were concerned. And since workers at those types of firms tended to be the offspring of previous or present employees, there was social pressure to conform to the norms of obedience lest you cause family members a loss of face by trying to subvert the standards. Now, with the rise of e-commerce and entrepreneurship, when companies are smaller, employees are often arranging with co-workers for a schedule that is longer than that bestowed by the government. It’s common to find companies with a handful of employees who’ve just decided to shut down for a month or more, to finally untangle themselves from the tensions of a Chinese economy that often seems to never take a day off. There’s also been speculation among some observers about how a growing number of Chinese aren’t traveling back to their birthplace or succumbing to social pressure to see their parents, but striking out of their own—which usually means going overseas. That’s certainly been the case for fun and discovery, as well as reconnecting with family members who have emigrated. But from a local perspective it’s remarkable how many Chinese this New Year have decided to use the car they purchased for commuting to work and the extended family piling in simply to explore other parts of China. This year, it’s been common to see cars from far-off provinces in various localities, perhaps for just a day or two, sometimes for an extended stay. Retailers and renters welcomed this influx of outsiders but for more than a few, it was just another headache during the holiday. In some cities in Jiangsu, traffic police bemoaned the proliferation of outsiders with no experience driving in urban settings, showing up and thinking regulations couldn’t possibly apply to them because they were on holiday and shouldn’t be expected to be familiar with such matters as restricted bus lanes and private parking. 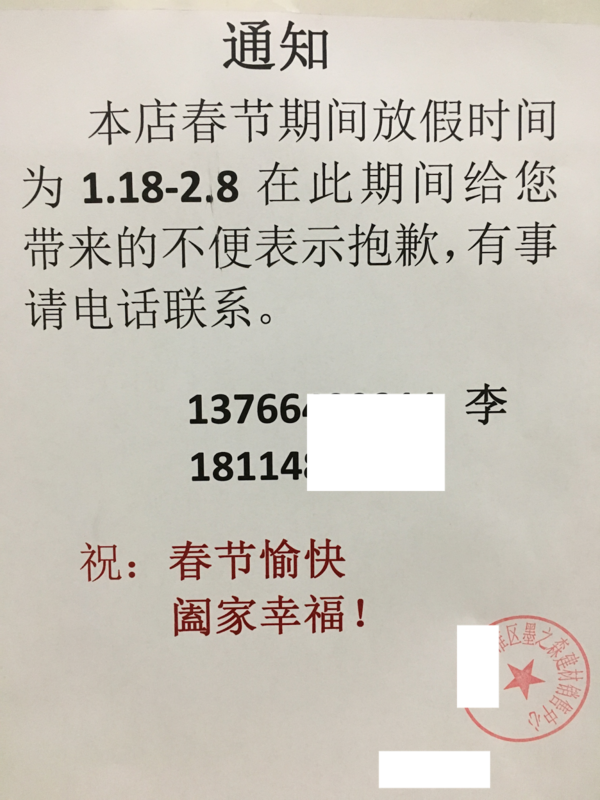 Some residents in Nanjing were stunned to find that their allocated parking space in their compound was filled with someone else’s vehicle—a relative of a resident, say, who decided to leave it there while the family and relations or friends went away to Europe for a few weeks. As with so much of other types of social conduct in China, permission isn't often part of one’s personal portfolio--especially when it came to exercising one’s ability to drive. And then there’s the local impact of so many people simply departing, closing up shop (literally), and not always leaving reliable word as to when they’re coming back—or if they actually are planning to return. Some do, of course; but even when a well-meaning merchant or service worker wants to get back to business, the transport network and ticket system—vastly improved though they both are—might fail them. Promises to reopen by a given date can’t always be kept, no matter the fine intentions of a printed notice. And because every Chinese New Year brings change, in particular to many small vendors, there are landlords who look for new tenants in the wake of an expired lease, and tenants seek a new start or are forced to make one in another place for various reasons. The many closed and locked doors of restaurants, small retailers, and market stalls might represent just a few well-deserved weeks away from the daily grind for some, or they may well signal a more permanent evacuation by the previous occupants. 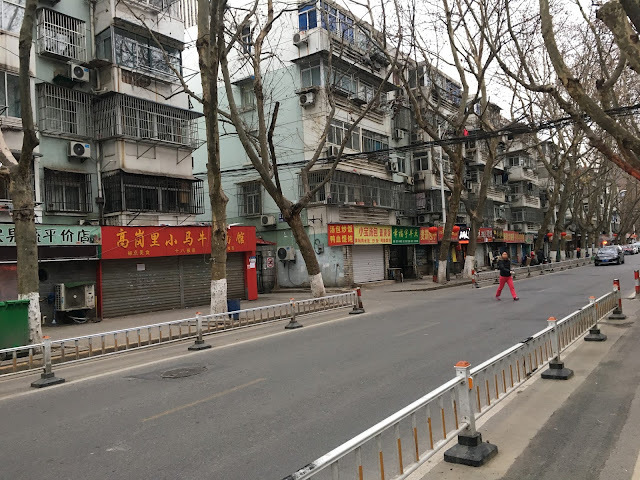 Because customers in local China focus on reliability, the relations that vendors have forged in previous months are in jeopardy when residents don't know when a place and person they’ve grown to trust will be seen again. That may seem like a small matter in a big country, but in local China, everything seems large. It’s surely nice for some to have exercised some new options, and to make a new start with the new year. For others here in Local China, the new uncertainties that are produced by all this change may not be worth celebrating.